While saving money is great when you are working with a limited budget, adding to the guest experience is important as well. There are ways to do that without spending a lot (or any) extra money. 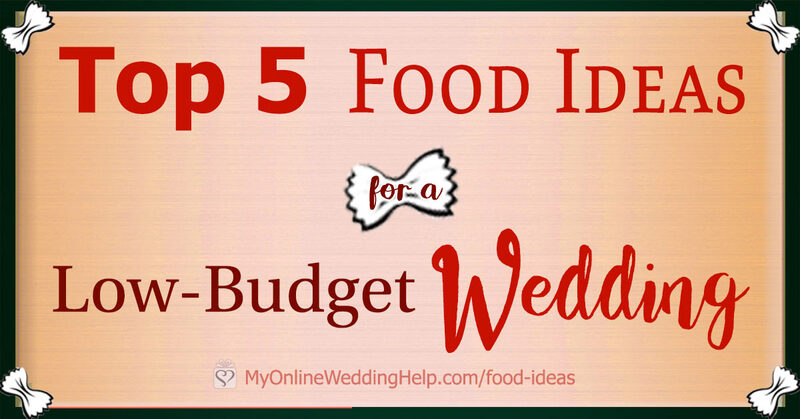 Here are some wedding food ideas on a budget to get your creativity started. 1. Have custom food stations consisting of relatively inexpensive ingredients. Made-to-order food stations are interesting to guests. They also allow for meal customization. Options to consider include omelets, stir-fries, waffles or pancakes, pasta, wraps, savory crepes, fresh tossed salads, paninis, kabobs, and baked potatoes. 2. Consider an ethnic menu rather than American. Consider your options carefully and you can provide a unique experience to guests. Mexican, Chinese, Italian, Indian, Greek, or other cultural foods can fit your budget. Here are some ideas for each. 3. Serve breakfast no matter what the time. There’s no law that says you can only eat breakfast foods in the morning. For many, it’s an unexpected treat to have breakfast for dinner. As a bonus, it is easier on your pocketbook. In a way, this is a cross between sit down and buffet service. Place large bowls of food at each table. Guests pass the dishes around, taking what they like from each. This encourages more interaction between guests than other serving styles. Consider hiring college students or other responsible young people to serve food and drink. The downside, of course, is they are not trained professionals. 6. Have unusual yet inexpensive presentation dishes. What you put the food in can have as big an impact as the food itself. Martini or shot glasses; spoons for bite-size appetizers; melon or pumpkin shells; and lemon, cucumber, or orange rinds all make for conversation-worthy presentation.